The emergence of heavy-duty battery power is certainly an exciting time for the green energy movement. Think about Tesla’s record-breaking 100 megawatts (MW) in South Australia, which runs off of wind energy. An impressive feat for battery power, which is why it’s making headlines across the globe. The problem is that battery power is expensive — about 60% more expensive than a traditional generator, according to Bloomberg. And even at 100 MW —the largest battery system today— it still falls short of South Australia’s energy needs. To make up the difference, they’re installing a 200MW diesel generator for a fraction of the price. Plus, the cleanliness and reliability of battery power are dependent on the cleanliness and reliability of the grid that’s charging it. Whether your grid is run off of coal or solar will affect the overall footprint of a battery system. And the variability of wind and solar power (cloudy days produce less power than sunny ones) will affect a battery’s reliability. 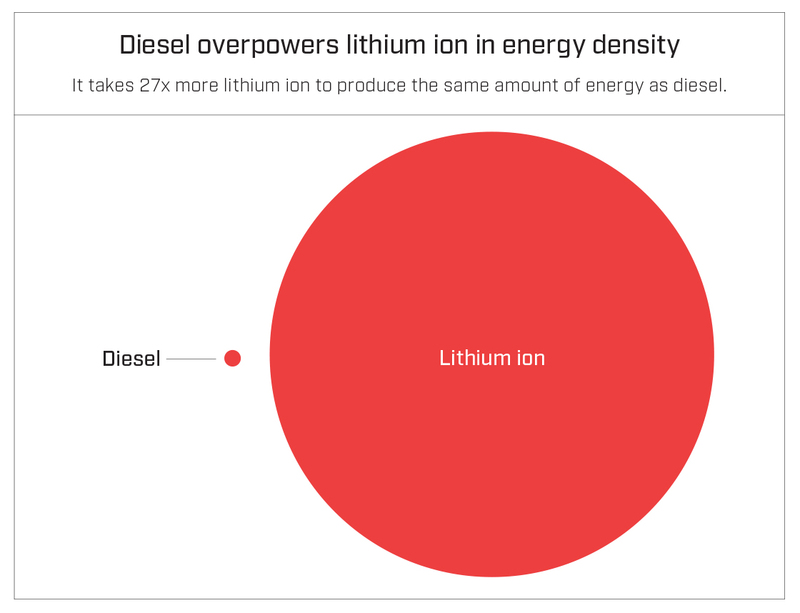 Diesel is the most efficient combustion engine fuel source, carrying 38 kilowatt hours of energy in every gallon — 27 times that of lithium ion batteries. Clean diesel technology is efficient, clean and affordable. Plus, it’s proven — there’s heavy duty equipment in the field today that’s been there for two or three decades. In the wake of the EPA’s ever-heightening emissions regulations, diesel technology is cleaner than ever. Since the EPA tiered regulations began rolling out in the late 1990s, there’s been a 99% reduction in harmful pollutants, according to the Diesel Technology Forum. In some cases, the exhaust is cleaner than the ambient air going in. Diesel technology has been around for a while, making it more affordable than alternative power sources. It costs $86 in upgrades to remove one pound of potential NOx emissions, whereas it costs $165 in battery charging infrastructure to remove the same amount. And diesel can save money from reduced downtime, as you can immediately refuel your unit rather than waiting for it to recharge. A big obstacle for electric transportation vehicles is the lack of charging infrastructure in remote parts of the country. One major line of all-electric transit buses ran into this roadblock. Even though their buses were equipped with rooftop solar panels, nighttime and long-range routes proved to be a challenge. When the bus company came to CK Power with this problem, we suggested a hybrid electric-diesel solution. Along with Girtz Industries, we custom-engineered a line of compact, operator-friendly charging containers that relied on a Tier 4 diesel generator to provide electric charge for the buses. These charging containers provided clean, reliable diesel energy to supplement the bus line’s solar and electric power. Smart hybrid solutions like this one are essential as we seek to power our industries with clean energy sources. There’s a time and place for both technologies, so when it comes to deciding which is better for your application, it’s not really a matter of either / or. You need to take stock of your preferences, the needs of your application and your budget. In an application where you’re going to be far away from a power grid for extended periods of time, diesel power makes the most sense. If, however, you’re operating lots of equipment in one area close to the grid, battery might make the most sense. For instance, in a port, you might use battery-powered equipment to save the time and expense of storing and maintaining diesel fuel. To learn more about how diesel energy stacks up in the modern world, read our guide comparing clean diesel to battery, explaining how manufacturers have responded to diesel emissions regulations, making diesel one of the cleanest and most inexpensive energy options available today. Download the guide.